The last time we were in San Francisco, we stopped in at True Sake and picked up a bottle to bring home. Are we sake drinkers? No, not really. That bottle sat in our cupboard for over 2 years. I picked up a copy of Salmon: The Cookbook edited by Bill Jones at the Vancouver Boat Show a few weeks ago and have been salivating over it ever since. Tonight this recipe jumped off the page, and I remembered that bottle of sake languishing in the liquor cabinet. With citrus fruits at their prime right now, it just seemed like the right thing to do. Hope you like it as much as we did. I’d appreciate your ideas for what to do with the leftover sake, besides just drink it! Do you have a recipe using sake? Very lightly oil the bottom of a baking dish that is big enough to hold all the fillets in a single layer. Place the salmon in the dish, skin side down. Combine remaining ingredients in a small saucepan. Bring to a boil and cook until it is reduced by half, about 8 – 10 minutes. Brush the salmon with the sauce and bake for about 10-12 minutes, depending on the thickness of the fillet. It should feel firm to the touch and just begin to flake. Brush a couple of times with more sauce during baking. Do not overcook. Change the oven to the broil setting and place the fish under the broiler until the glaze begins to caramelize. Serve and savour. 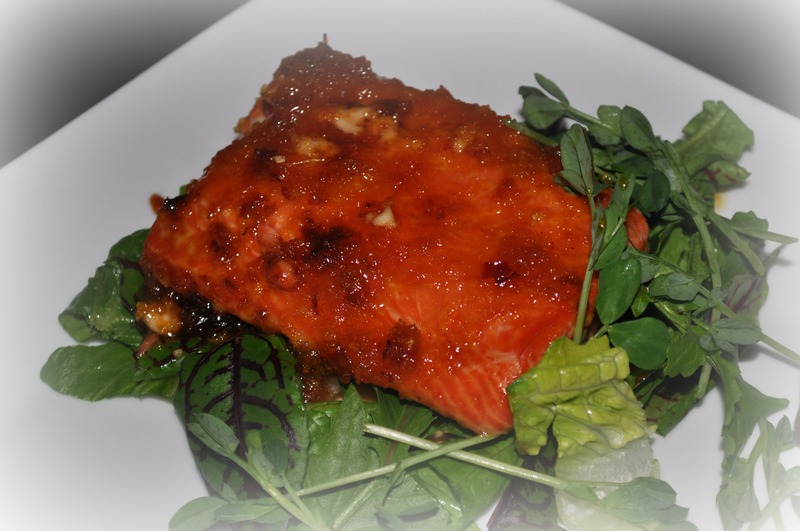 This entry was posted in sauce, seafood and tagged Asian salmon, citrus sauce for salmon, honey citrus sauce for fish, sake salmon, sake sauce for fish, salmon with citrus and chili paste. Bookmark the permalink.